Ronald Rael and UC Berkeley's College of Environmental Design have created an innovative 3D printed building made from powdered cement. 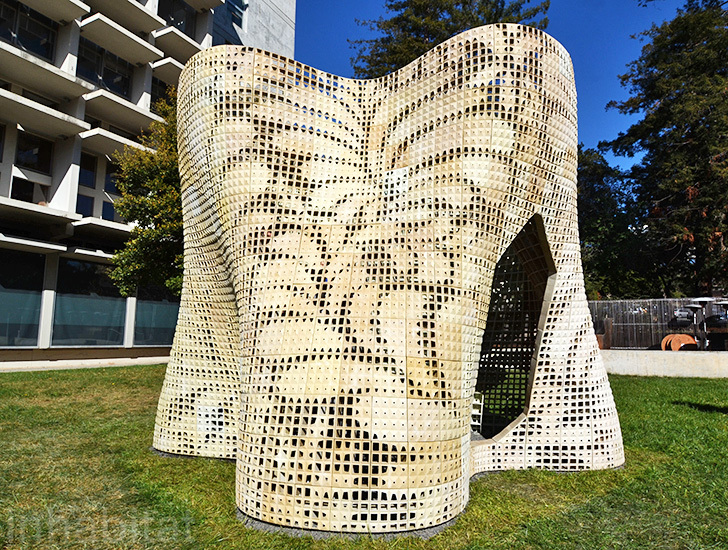 Measuring 9 feet high by 12 feet wide and 12 feet deep, the swirling Bloom pavilion is composed of 840 custom-printed blocks made from an iron oxide-free Portland cement polymer. The variegated bricks are printed with delicate floral patterns that allow natural light to shine into the pavilion's interior, and the building glows like a lantern when illuminated from within. 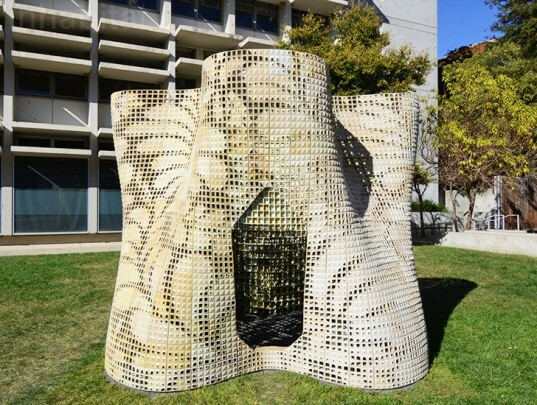 UC Berkeley's College of Environmental Design calls it the "first and largest powder-based 3-D-printed cement structure built to date." 3D printing technology has advanced by leaps and bounds over the past decade. Whereas the first printers slowly churned out tiny trinkets and figurines, today’s advanced printers can produce functional tools, full-sized furniture, automobiles, and even entire buildings. Ronald Rael is pushing the technology to its limits, and the new Bloom pavilion opens up new possibilities for the field of 3D-printed architecture. Rael is an associate professor of architecture at Berkeley’s College of Environmental Design and co-founder of Emerging Objects – a 3D printing think tank that recently developed a brick that can cool buildings using only water. He worked with Thailand-based Siam Research and Innovation and a graduate student research team composed of Kent Wilson, Alex Schofield, Sofia Anastassiou and Yina Dong to develop the elegant, curving structure made from 840 precisely printed bricks. After its official unveiling yesterday, the Bloom Pavilion was disassembled and shipped to Siam Research and Innovation in Thailand to be displayed for several months before touring the world. Wow, this structure is absolutely beautiful! I can't believe it is 3D-printed. It just amazes me what is printed nowadays, including the 3D-printed car (http://bit.ly/3DPcar). They need to more clearly qualify the term "building" when referring to a construct with no roof. One could also argue the size, when the curves result in a dramatically smaller usable space than the "12 feet wide and 12 feet deep" given. This is more akin to the modern art lining the roads at many universities than a "building". Interesting as proof-of-concept for the printed cement polymer, but not much more. However: The link by lumps is interesting. The page gave me a link to another one at https://www.youtube.com/watch?v=aQ_WqvjJtDw which can print an entire building structure at once using similar technology, which adds trowels to improve surface quality. However, the video looks like the full-size version may or may not have been created yet - the non-rendered large-scale device looks like the one from the other link. One could also point out that this technology is not "high-resolution", but I'd point out that the two technologies could be used together - one to print a large-scale structure (which it can do either in one piece or in sections for a much larger structure) while the other can print more ornate parts, such as tiles for a nicer surface. These tiles could possibly be pressed into or printed onto the soft (uncured) sides of the larger structure without further adhesive to create a finished product. Though if I were pressing tiles into the sides, I'd probably go with something that includes either solar power generation or fiber optic ducting for interior lighting. As I said, more a proof-of-concept to be applied in other ways. http://youtu.be/OYqBxEAtXZA That's the link. Research should be made before making a claim. Plus where is the roof? Im pretty sure the video I watched last week on youtube of a company in China has the capability to build houses bigger than that with a 3D printer. Not only that but they are able to produce 10 in a day. 3D printing technology has advanced by leaps and bounds over the past decade. Whereas the first printers slowly churned out tiny trinkets and figurines, today's advanced printers can produce functional tools, full-sized furniture, automobiles, and even entire buildings. Ronald Rael is pushing the technology to its limits, and the new Bloom pavilion opens up new possibilities for the field of 3D-printed architecture. Rael is an associate professor of architecture at Berkeley's College of Environmental Design and co-founder of Emerging Objects - a 3D printing think tank that recently developed a brick that can cool buildings using only water. 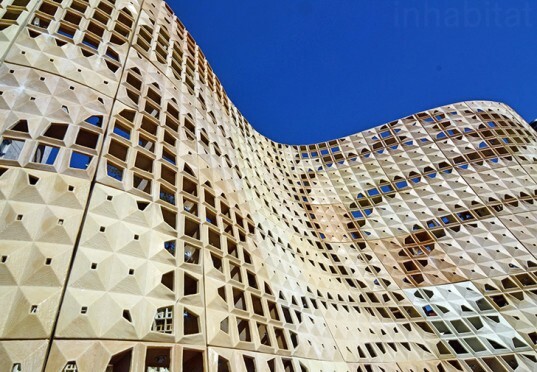 He worked with Thailand-based Siam Research and Innovation and a graduate student research team composed of Kent Wilson, Alex Schofield, Sofia Anastassiou and Yina Dong to develop the elegant, curving structure made from 840 precisely printed bricks. The Bloom pavilion's construction process and materials set it apart from from other 3D printed structures. Most 3D printed buildings are created by extruding wet cement through a nozzle. This process creates durable buildings, however the finished product is rough and imprecise. Bloom was constructed over the course of a year by 11 3D Systems printers using powdered cement, polymers, and fibers. This process minimized waste and yielded strong, lightweight bricks printed with high-resolution details. 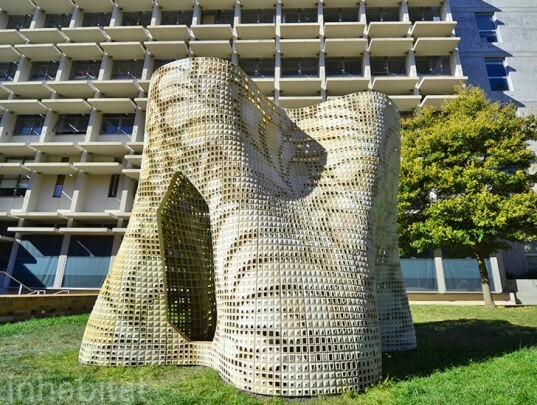 According to UC Berkeley, "Bloom is a precise 3-D-printed cement polymer structure that overcomes many of the previous limitations to 3-D-printed architecture. Such limitations include the speed and cost of production as well as aesthetics and practical applications." 3D printing technology has advanced by leaps and bounds over the past decade. Whereas the first printers slowly churned out tiny trinkets and figurines, today's advanced printers can produce functional tools, full-sized furniture, automobiles, and even entire buildings. Ronald Rael is pushing the technology to its limits, and the new Bloom pavilion opens up new possibilities for the field of 3D-printed architecture. After its official unveiling this afternoon, the Bloom Pavilion will be disassembled and shipped to Siam Research and Innovation in Thailand to be displayed for several months before touring the world.